Picture: Balloon Nepal Pvt. Ltd.
Pokhara— Balloon Nepal Pvt. Ltd. has officially commenced the commercial hot air ballooning in Lake City Pokhara from Saturday. Gandaki Province Chief Minister Prithvi Subba Gurung inaugurated the service, enjoying the balloon ride from the banks of Phewa Lake this morning. 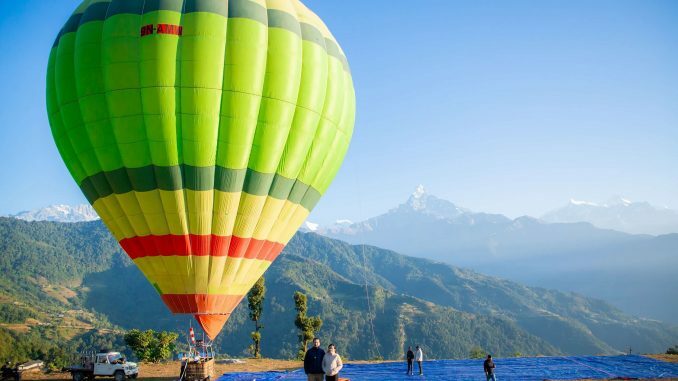 Following the commercial flight of balloon, Pokhara has got yet another tourism product in adventure side. A total of eight persons can enjoy the flight in a balloon and the company has two balloons. Only one will be operated in preliminary phase. The company aims to develop Pokhara as a destination of sports and adventure tourism, Informed on of the company promoters Prabin Maharjan. Tourist village Dhampus of Kaski has been chosen as a takeoff venue of commercial flights and Mardi Khola banks are the landing zones. According to press notes released by the company, a total of 25 persons would get the employment form that service. Rs 20 million balloons have been brought from Spain and experienced pilots have been hired from India. Later, pilots would be produced in Nepal too. Nepali tourist should pay Rs 11,000 per person and USD 160 for a foreigner to enjoy the balloon ride. The company has got the authority of flight from Tourism Ministry of Nepal. The hot air ballooning was first started during Visit Nepal Year 1998 in Nepal.